Basic Lubrication - The most basic plan includes routine examination and lubrication of equipment. Parts, service calls and safety tests are excluded from the contract. Partial Maintenance - The basic plan with an allowance added to cover a specific number of monthly repair hours and a specific monthly parts limit. Full Maintenance - The most comprehensive plan includes all materials and labor to maintain the elevator system with exclusions for obsolescence and misuse. 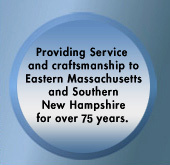 At Embree Elevator we pledge to tailor a maintenance plan to meet your requirements. Please call us to set up a meeting to review your elevator maintenance program.